Really personalize the lighting in your home when you make an lit-up marquee letter in your own monogram. Hunting for a statement piece that really speaks to you requires a certain amount of time and patience. Fortunately for those of us lacking in the latter, there’s often a homemade alternative to customizable to our exact vision to speed things along. 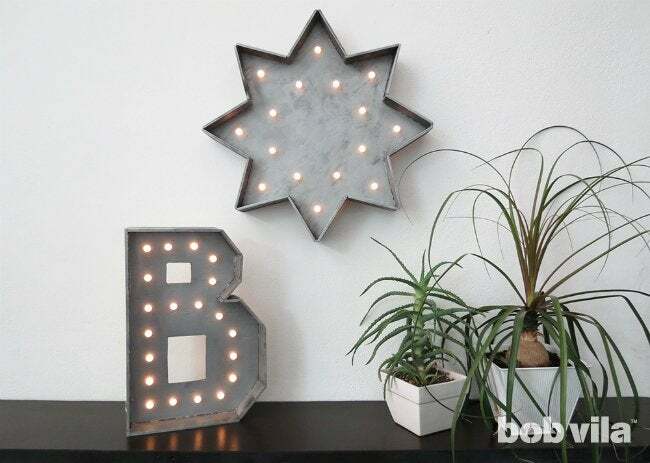 Rather than resorting to picking through every estate sale for the large marquee letters, symbols, and full signs that can be found trending in interior design today, this LED-powered version emulates the typical reclaimed style in whichever design you desire. 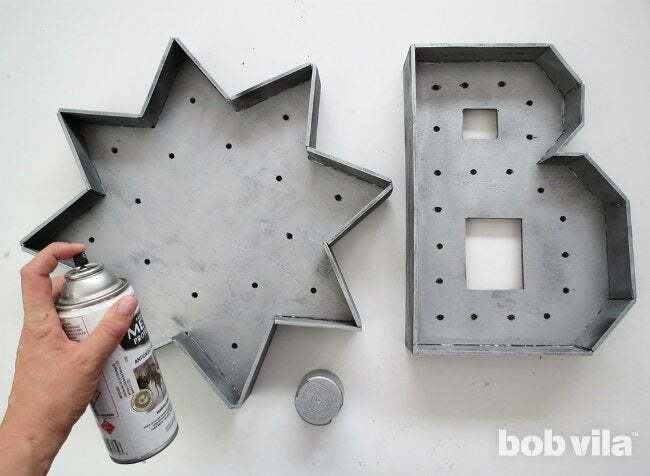 Though this DIY project appears to be made from weathered metal, you can actually recreate its vintage vibe using mere plywood. Fashion one or enough to spell out the family name following these straightforward steps. 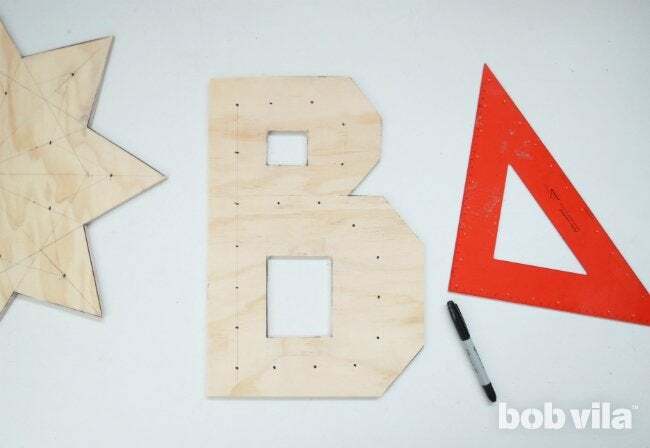 First, dream up the design for your three-dimensional, light-up sign. We made two: a 16″-tall “B” and a sun with a 20-inch diameter. Whatever you choose, opt for angles over curves. This swap enhances the rough industrial appearance of your finished work, but more importantly it simplifies the processes of cutting the plywood and framing its edges. 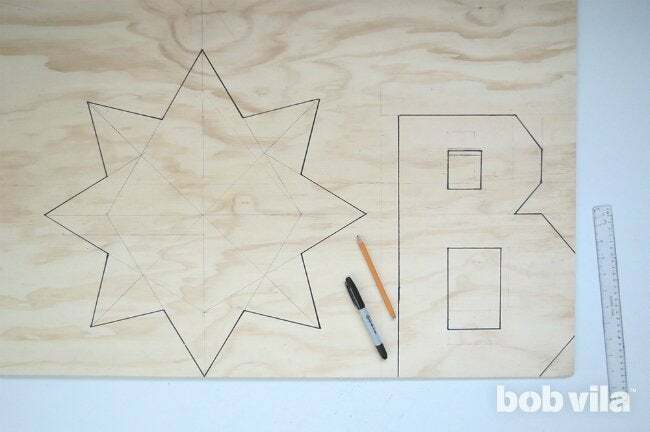 Once you’ve decided the shape you want to build, sketch it on the back of a 6 mm plywood sheet, using a ruler for optimal straight edges. Tip: For best results when it comes time to insert the light bulbs, scale your design so that its dimensions in inches are multiples of two. Cut along the penciled perimeter of the shape using the jigsaw. 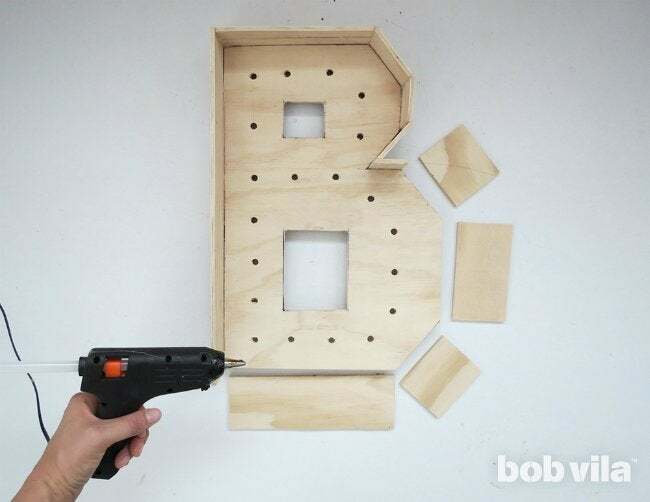 If your design includes a hole cut from the center (like the two small rectangles to make the openings in the letter “B”), drill holes in each corner of the interior shape and cut along the lines with the jigsaw so that it pops out easily. Smooth all sides and edges of the plywood with either sandpaper or a palm sander to remove every splinter. Aim to space bulbs over the width and length of the marquee letter so that they are equidistant. In our case, we placed the first bulb two inches from the edge and set the rest 2 inches apart from one another, but the distance may vary depending on the dimensions of your marquee letter and the size of the bulbs. 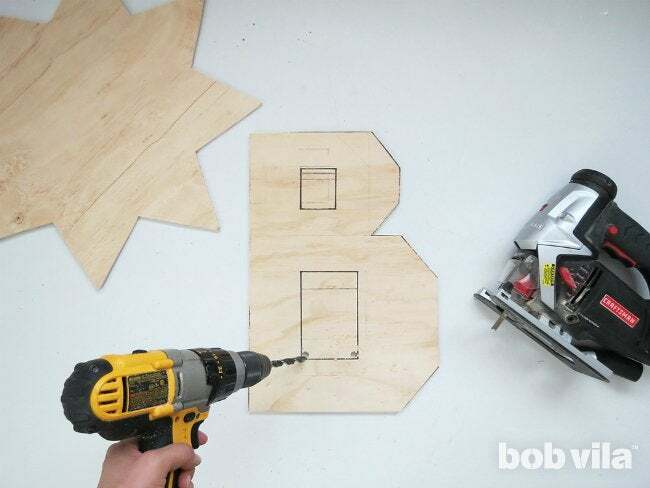 For every mark, drill a hole. The drill bit size must match the size of the base of the bulb so that it can pop through. Here, we used a 3⁄8-inch drill bit. 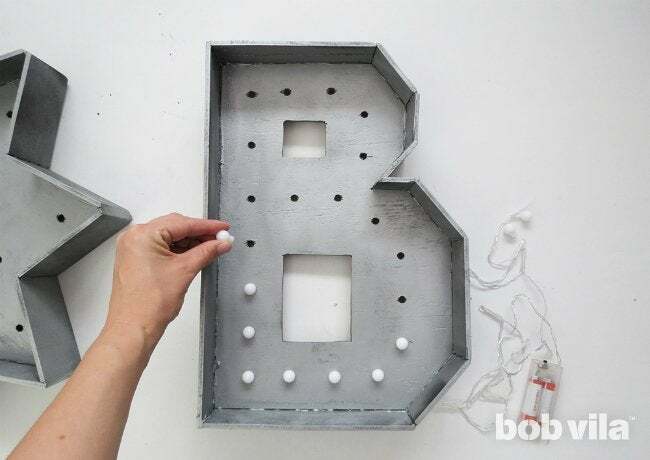 Add depth to your three-dimensional marquee letter by creating an edge with a shadowbox effect to run along its perimeter. Start by cutting the project’s leftover plywood into a strip or two, each 3 inches wide and as long as the board. 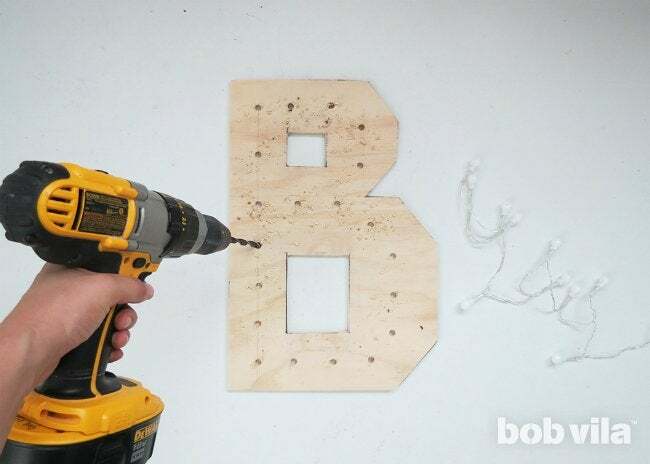 Now, position a 3″-inch wide strip along the top side of your marquee letter to match it in length exactly; mark the length on the plywood strip, cut, and stand it up on edge against the marquee letter. Working clockwise, lay the remaining 3-inch plywood length against the side that connects on the right. This time, adjust ever so slightly—by roughly 6 mm, the thickness of the plywood—so that this length overlaps the edge of the last strip you cut and spans to the end of this side of the letter. (This little bit of overlap minimizes gaps at at the corners between edge pieces.) Mark where you’ll want to make your cut, use your jigsaw, and stand this second edge up just the same. Repeat this process as you work your way around the marquee letter. The final side should be long enough to cover its side and the extra 6 mm of plywood at both ends. Now, prepare to glue. 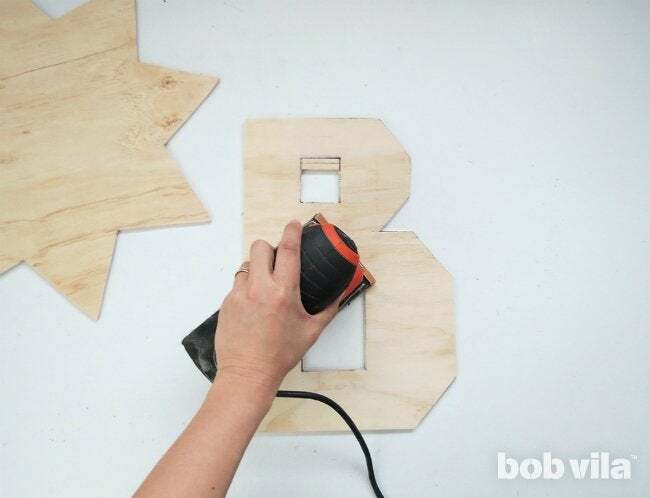 You want the marquee letter’s 3″-wide casing to stick out 2 inches in front and 1 inch in the back (that’s how you’ll hide the cord), so it may be helpful to pencil a line length-wise along each plywood strip to guide your gluing. Then apply either hot glue or wood glue to the strips along the drawn lines, and press them to their coordinating sides. Hold the sides with clamps while the glue dries. 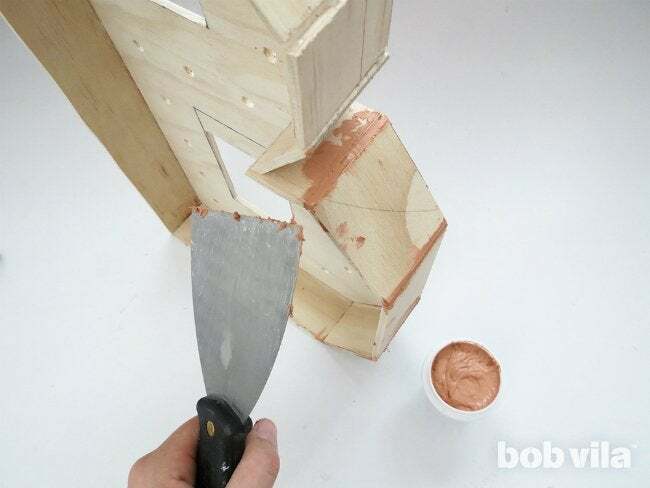 Apply some wood putty using a putty knife to fill in and smooth over any remaining gaps at the corners. Once completely dry, sand the edges to remove any blemishes. Finally, the key to transforming the plywood structure into a metal-look marquee like lies in the two-part painting technique. First, completely coat the piece with black spray paint and let dry. 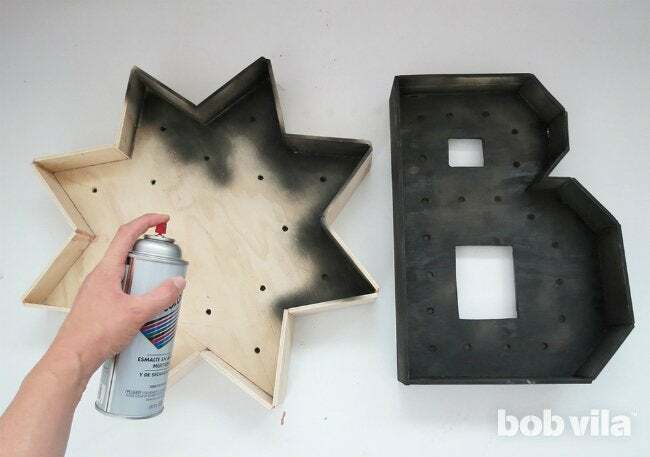 After your black paint has completely dried, apply a top coat of silver hammered spray paint. This round, it’s less important to cover completely; the black paint peeping through—in addition to the metallic spray paint’s unique finish—will visually age the marquee. 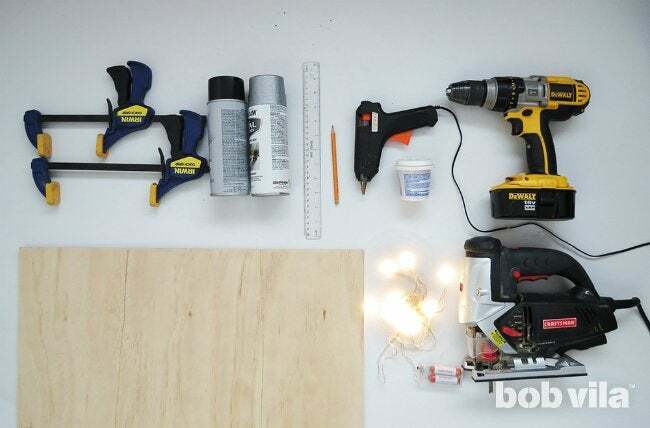 Unscrew the LED bulbs from their string, and place one in each hole with a little glue. When dry, you can reconnect the string lights to their bulbs from the back. 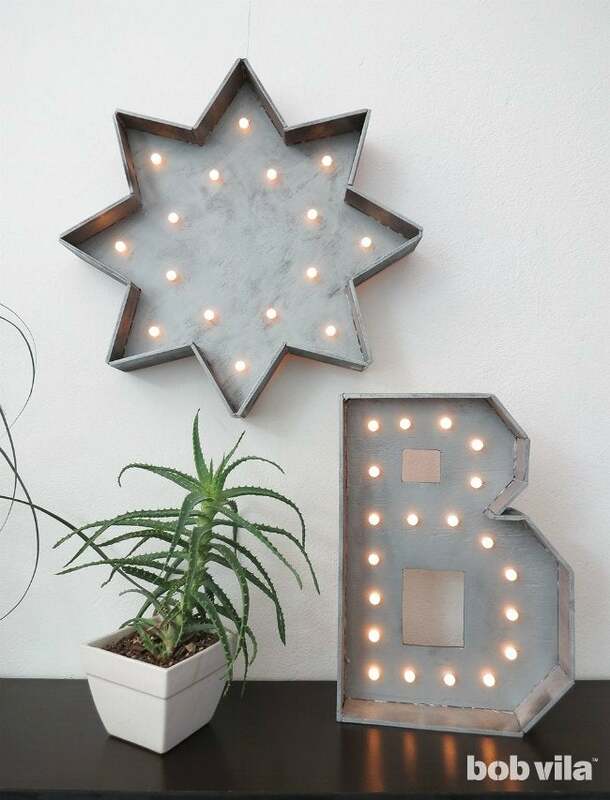 Then take your one-of-a-kind marquee letter and display it either standing upright or hung on the wall. The unique design is sure to brighten up—quite literally—any shelving arrangement, bar cart, or gallery wall.